This post was inspired by this other one, featured in WordPress’ Freshly Pressed section, on how should non-scientist read a scientific paper. While the approach presented therein is both valid and valuable, I’d like to address the way I think a scientist should read a paper, given the fact that we need to read a lot of them at all times. Each scientist has their own reading style, not to mention their own writing style, and while my CV could indicate I don’t know how to do neither one, here I present to you my scientific-paper-reading style which I consider to be the most suitable for me. I’d like to start by emphasizing that I dive into scientific literature in a bona fide fashion. That is not to say I’m totally naive or even gullible, but even when science is all about questioning and casting doubt onto all sorts of claims, we can’t re-develop every bit of science we need. At a certain point we must start *gasp* believing trusting other scientists’ claims. Reading in what I call bona fide is not mutually exclusive with critical reading. This sort of scientific trust is earned, to a degree, mostly by two indicators: Author’s preceding reputation at the time of publication of any given paper as well as the journal’s. Both indicators aren’t without controversy and flaw. The way I read a paper is the following: I start with the Abstract, then follow with the Conclusions, then the Results section, sometimes I read the details of the methodology and seldom read the Introduction. Let me explain. I read the abstract first because I read in bona fide as I hope the authors wrote the paper in bona fide. If properly written, the abstract should include all the relevant information as to what was done, why, and how but also point to the knowledge derived from it all: Their conclusions! and that is why I follow with that section. I’m interested in knowing what the authors learned and ultimately want me to learn about their study. Once again I’m reading in bona fide, so I hope they weren’t tempering their results to fit their preconceptions, that all experiments were thoroughly self-judged, validated, correlated, referenced and controlled. Recently, my sister Janet, who is a physicist working on her PhD in neuroscience, told me about some friends of hers who never (shall I say, never have I ever?) read the conclusions as to not becoming biased by the authors. To me it seems like too much work having to scrutinize every piece of data again in order to come up with my own conclusions when authors, collaborators, people on the hallway down the lab (optional), referees and editors (vide infra) have already (hopefully) done it (properly). Still I put on my scientist badge and question everything I critically read in the results section trying thus to understand how did the authors reached their conclusions and asking myself if I could come up with something entirely different. No? OK, how about something slightly different? Still no? Well, do I agree with the authors on their findings and their observed results? And so on. I like thinking that my critical reading process resembles the Self Consistent Field method which iteratively reaches the best wavefunction for a set of certain given conditions, but it never reaches the exact one. The methodology section is a bit tricky, specially when it comes to computational chemistry. Back when I was a grad student, working in an inorganic chemistry lab, I’d only read the methodology if I had any plans of reproducing the experiment, other than that I didn’t care too much if reagents were purchased from Aldrich or Fluka or if the spectrophotometer was a Perkin Elmer one, I just expected authors to have purified their reagents prior to usage and calibrated all spectrophotometers. Now in computational chemistry I read about the methods employed, which functional and what basis set were used and why were they selected are my most frequent questions, but the level of theory is usually stated in the abstract. I also take a look at what methods were used to calculate which properties; these questions are important when we have to validate our trust in the results in front of us. Finally, I seldom read the introduction because, if the paper is relevant to my own research, I don’t need to read why is important or interesting, I’m already sold on that premise! that is why I’m reading the paper in the first place! If both me and the author act in bona fide, we both already know what the state of the art is, so lets move on because I have a ton of other papers to read. Hence, I read the introduction only when I’m trying to immerse myself in a new field or when reading something that seems interesting but which has little to do with my area of expertise. There is another reason why I almost never read introductions and that is that, even when I try to work in bona fide, there are a lot of people out there who don’t. Twice have I received the reviews from a mysterious referee who believes it would serve the work a great deal to cite two, maybe three, other papers which he or she lists for your convenience, only to find out that they all belong to the same author in each case and that they are not quite entirely related to the manuscript. In the title of this post I also try to address the writing of a scientific paper, although I’m not an authority on it, I think today’s key phrase is bona fide. So to young and not so young scientists out there I’d ask you to write in bona fide, please. Be concise. Be convincing. Be thorough and be critical. This is science we are doing, not stamp collecting. It shouldn’t be about getting all sorts of things out there, it is about expanding the knowledge of the human race one paper at a time. But we are humans; therefore we are flawed. More and more cases of scientific misconduct are found throughout the literature and nowadays, with the speed of blogging and tweeting, we can point at too many of them. The role of bloggers in pointing this frauds, of which I’ve written before here, is the subject of recent controversy and possibly the topic of a future post. We are all being scrutinized in our work but that shouldn’t be an excuse to make up data, tinker or temper with it, to push our own personal agendas or to gain prestige in an otherwise wild academic environment. I for one may never publish in Science or Nature; I may never be selected for any important prize, but even the promise of achieving any of those is not worth the guilt trip of lying to an entire academic society. I try then, to always remember that science is not about getting the best answers, but about posing the right questions. What is your own style for reading papers? Any criticism to my style? How different is the style of a grad student from that of a researcher? As usual thanks for reading, rating and commenting! I was first introduced to Bradbury’s writing in 1989 during my first year in junior high school (here in Mexico that is the 7th grade; I was eleven years old then) by my literature teacher Ángel Molina-Aja at LOGOS School, a progressive institution in southern Mexico City; so now with the departure of the grand master of Science Fiction I can’t help but to think about Ángel and his possible motivations for making us read ‘The Martian Chronicles‘ of all possible books. It is pretty obvious now that his intention was to engage us in literature (prior to ‘Chronicles‘ we read ‘The Hobbit‘) and to make us read something that would in turn make us want to read more and so by reading we would open a world of possibilities to ourselves. His job as a literature teacher wasn’t just to make us learn about literature but to learn how to appreciate it for the values that leaves in our lives, whatever our own inclinations were. As I’ve written before, science fiction is a usual common denominator to us people working in science because we deal with imagining how to bring to life things and ideas that are currently nonexistent. Whether we create new materials with new applications or we come up with wacky mathematical theories that describe the intricacies of the universe, we all have to first set our imaginations free and believe everything is possible. In this way we are sometimes less pragmatical (albeit not necessarily more creative) than lawyers, business people and the like. Education should then be formative, not informative, in order to make an intellectually resourceful population in every area of the human and social development. Here in Mexico the average reading habit is less than 1 book a year per person! and with the upcoming presidential elections and the respective campaigns, it becomes obvious that a poorly read people is a very manipulable one. And the idea of an ignorant population kept in line by the ruling powers through alienating them from literature is the main theme of Bradbury’s other masterpiece ‘Fahrenheit 451‘, in which a fireman is a person who starts fires in order to destroy books (it is widely known by now thanks to this novel that 451 degrees Fahrenheit is the temperature at which common paper ignites itself). In ‘Fahrenheit 451‘ books are banned because they make people unhappy and unsettled by showing them a world of possibilities that they may or may not achieve, so it is safer to just satisfy people basic needs, which include 24 hours of personalized TV programming on every wall of their homes (sounds familiar? ), and by doing so they wont question their leaders or their position in society. They just wont have dreams! That’s the bottom line. The many troubles of my country won’t be solved by people reading Bradbury, but if I was engaged into literature by ‘Chronicles‘, among other books from other authors, and by that engagement I was able to discover the world of science and decide I wanted to become one, then the ripple or domino effect triggered by reading, reached its goal; a goal set by my teachers, to whom I will be always most thankful. I wish I could post a picture of my old copy of ‘Chronicles‘ but I guess it’s back at my parents place all worn out. I have to remember taking a picture of it next time I visit my folks. 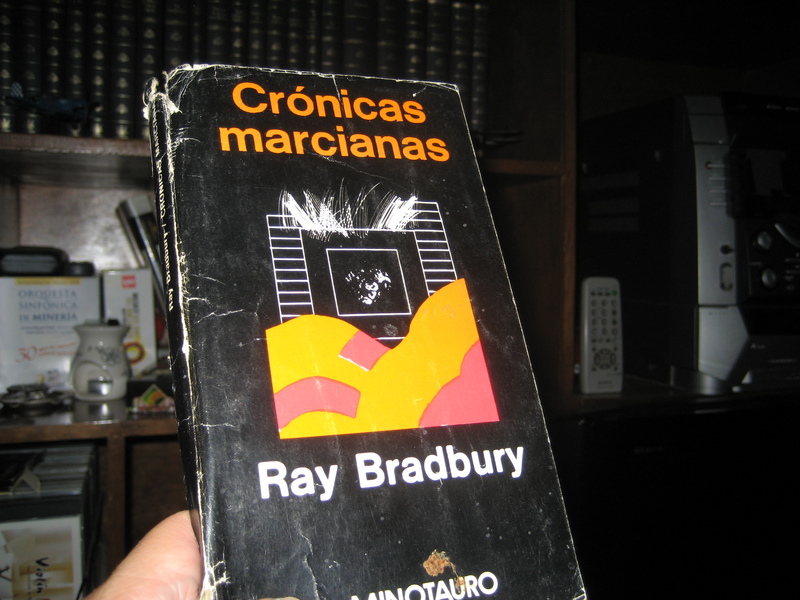 Here is a picture of my old copy of the Spanish translation to ‘Chronicles‘ all worn out thanks to me and my sister, I guess. Thanks to my dad and his ninja-dropbox-skills for getting this picture for me! Bradbury’s work and specially ‘The Martian Chronicles‘ romanticized the idea of space exploration. What a huge coincidence, in a sort of a poetic way, that his departure occurred on the same day as the transit of Venus, a phenomenon that will not occur for another 105 years. I wrote earlier on my facebook page that he did not died, that he only went back to Venus. I was close to not posting it for it might be in bad taste, but then I thought that I don’t know what happens when we die and nobody else in the world does either, so this is as valid as any other hypothesis but only more romantically so. Rest in peace Mr. Ray Bradbury and may this be a thankful testimony for all those hours of rational entertainment and enlightenment.